Creativity can’t be created directly, but it can be cultivated. As we soak up wisdom and engage in new experiences, the world shifts like fragments of colored glass in a kaleidoscope. As the kaleidoscope shifts, we see infinite varieties of beautiful colors and symmetrical forms. We don’t see the universe as it is; we see it as we are. Each species experiences and understands its environment in terms of how it perceives it. Bats respond to sound and sharks to smell. As we change, so does the world, and as the world changes, so do we. The landscape of creative potential is always expanding. Creativity is born out of this co-evolution between ourselves and the world. Combinatorial possibilities emerge with each new theory or invention. Every now and then, when order emerges out of chaos, creative potential is born. It's impossible to be creative when stuck in your routine. The best ideas don’t come when you’re narrowly focusing on them. When trying to be creative, there's a temptation to “think harder.” But after a while, you’ll reach the hopeless stage, where everything will be a jumble in your mind, and you’ll lose the forest for the trees. Stuck, you may lose faith. Resist the temptation to think harder. Turn the challenge of creativity over to your subconscious mind. Escape the chains of judgment and quiet your internal critic. Drop the problem. Activate your emotions. Stimulate your imagination. Read poetry, listen to music, or explore the city. Flashes of clarity arise when we least expect them. They emerge during periods of rest and relaxation, often after periods of deep thought and contemplation. Creativity is like a rubber band. It depends on the cycle of tension and release. While intense thinking often comes before creativity, new ideas tend to appear when the body is loose and the mind is relaxed. Bus — Travel, escape your routine and move like a river. The faster it flows, the clearer it is. Light fills fast flowing rivers with color and clarity. But when water sits still for too long, it turns mucky. Darkness descends, and clarity vanishes. The mind is like a river. It requires continuous flow; sometimes fast, sometimes, slow. Explore strange ideas. Speak to strangers. Meet new people. Try new foods. Read, write, and type. Move. Move. Move. Don't consume information. Interact with it. Wrestle with ideas, connect the dots between your experiences, and use that knowledge to make something new. Your pace of learning will accelerate — I promise. Like a swimmer in a pond, you can control where your mind wanders. If you swim with the current, you’ll be thinking the same things as everybody else. Carve your own, unique path instead. And as you do, let music be your tailwind. For the first time in human history, we’re all equipped with infinite libraries of on-demand music. Music exaggerates emotion. Through music, we can change our moods in an instant. We can: (1) Boost focus, (2) induce calm, (3) add adrenaline, (4) spur motivation and (5) amplify happiness — all of which can lead to creative insight. By transporting us through different states of mind, music makes us superhuman. By adjusting the tempo of information flow, you can achieve dramatic mindset shifts. On social media, consumption is quick, topical, and serendipitous. Social media feeds make the mind race. The volume, randomness, and diversity of ideas on social media double as lighter fluid for fresh connections. In books, consumption is deliberate, multi-layered, and continuous. Books require deep focus, By inspiring ongoing reflection, books help us analyze an idea from every angle, in every dimension, and over time, with enough reflection, books thread the tapestry of our psyche. To maximize creativity, the fast and quick nature of social media should be tempered with the slow and deliberate nature of books. If books give us the foundation for new ideas to rest upon, tweets and short articles unlock new and unexpected pathways for intellectual exploration. Life experiences are similar. What we experience in daily life is slow, raw and unfiltered. While everyday experiences take time and effort to make sense of, they produce original insight. Find your balance of fast and slow, timeliness and timelessness. Information flow is like a symphony. Every note plays a distinct role. Sometimes the music is shallow and simple, and at other times, it's deep and complex. As the tone, tenor, and beat of the music changes, every instrument performs a distinct, ever-evolving role. Harmony emerges when organic unity emerges out of separate instruments. By layering different speeds of information, we can simultaneously develop a sturdy foundation of deep knowledge and illuminating experiences and maximize the flow of new ideas. Creativity doesn’t happen inside our heads. Instead, creativity is born out of interactions between our minds and the environment we inhabit. As a result, creativity is a systemic phenomenon — not an individual one. Productivity is a solo quest, but creativity is a collective one. By adding productivity today, we can lose creativity tomorrow. Pursue dynamic environments. Eavesdrop on conversations and make friends with friends in different industries. Work with the door open, and when you do, show up regularly. Action stimulates inspiration more than inspiration stimulates action. Don’t wait for inspiration to strike. You have to show up before inspiration will. Pick a time, show up, and produce. Every day. It can take ten years to become an "overnight success." Our society romanticizes moments of insight, but eureka moments occur because of all the work that comes beforehand. Since social media is a highlight reel, it makes us think that success is easier than it actually is. We see the fortune without the hard work, the trophies without the sweat, the diplomas without the homework, and the performances without the rehearsals. As a result, it's easy to overvalue the outcome and undervalue the process. Creativity is the result of weeks, months, years, and decades of hard work. Legend has it that Isaac Newton was sitting under an apple tree when he was bonked on the head by a falling piece of fruit. Right then, Newton had an “aha moment,” which allowed him to come up with the law of gravity. The narrative is fun, but it’s misleading. By the time the apple fell on Newton’s head, he had already taught himself the mathematics of the 17th century, including Euclidean geometry, algebra, and Cartesian coordinates. Newton had also invented calculus, which allowed him to measure planetary orbits and the area under a curve. In total, Newton’s formulation of the concept of gravity was a result of more than 20 years of learning. Clock-in and get to work. And when you do, treat this daily ritual with respect and reverence. Forget mentorship. Focus on friendship instead. Like all creative superpowers, learning from people of all ages is fun and life-enriching. Unfortunately, school trains us only to spend time with people our age. As a result, young people don’t spend enough time with old people, and old people don’t spend enough time with young people. I know people in their 50s who are learning about cryptocurrencies from people in their 20s and people in their 20s who are learning economics from people in their 50s. These friendships benefit both parties. The chain of knowledge runs both ways. The mentorship is mutual, and the learning is implicit — not explicit. All things being equal, young people who surround themselves with older people will likely mature faster and reduce the chance of catastrophic, short-sighted mistakes. Likewise, older people who spend time with younger people will confront new ideas and challenge their own, narrowing thought patterns. Cross-pollinate ideas between age groups and let the ideas blossom like an artist during the Renaissance. New ideas are articulated by individuals, but generated by communities. During the Renaissance, humans escaped the sterile, lifeless mentality of the Dark Ages. 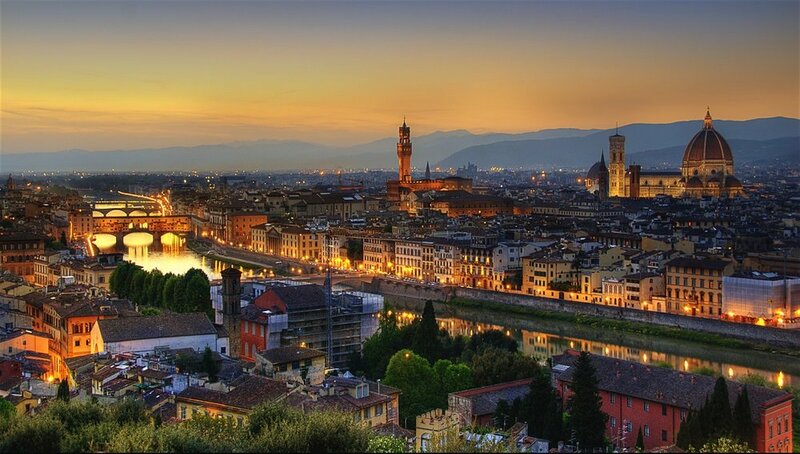 First, through trading, the manufacture of textiles, and finally the financial expertise of wealthy merchants, Florence was one of the wealthiest cities in Europe. Money wasn’t the only ingredient. The rediscovery of ancient Roman methods of building and sculpting, lost for centuries during the Dark Ages, also made the Renaissance possible. Under this atmosphere of wealth, urban leaders dreamed of making Florence the most beautiful city in Christendom — “a new Athens.” Florence was gifted with dazzling churches, spectacular bridges, and splendid palaces. Fertilized with regular doses of serendipity and a vibrant blend of wealth, culture, and ingenuity, The Renaissance triggered an intellectual explosion in Europe, which kickstarted the Enlightenment. Clusters of creativity emerge when beliefs, lifestyles, and knowledge pollinate. Inspired by this fusion of ideas, individuals can see new combinations of ideas with greater ease. Cities aren’t just a set of roads, restaurants, and people — they’re a set of interactions. In cities, we explore the frontiers of human thought and technology. Humans aren’t the only species that manufacture dynamism through density. Bees organize into hives, ants into colonies, and microbes into living forests. In each example, the whole is greater than the sum of its parts. Density isn’t the only urban tailwind. Cities are havens for free speech and eccentricity. According to a recent study, the formation of creative clusters is not preceded by increases in city size. Instead, the emergence of city institutions protecting economic and political freedoms facilitates the attraction and production of creative talent. The greatest serendipity engines of all, cities are where fragile, fringe ideas become concrete realities. New ideas are like a bird. They begin as frail thoughts, and like a bird, new ideas require care and protection before they can fly. And sometimes they were. Really dopey. Sometimes they were truly dreadful. But sometimes they took the air from the room, and they left us both completely silent. Bold, crazy, magnificent ideas. Or quiet simple ones, which in their subtlety, their detail, they were utterly profound. Build a nest around new ideas. Be gentle with them and watch them grow with time. Then, surrender to the world, let the universe work its magic, and watch creativity emerge. Sooner or later, creative potential will shine through the kaleidoscope.